This Saturday the 21 of January, I took part in the 100km Australia Day Ultra Marathon down in Australind. I have said the same thing for my last four events,that this has to be my favourite or one of them, and every time I go to another they just keep getting better. Although this event is going to be hard to top. I knew it was going to be a great day from the amount of fun I had at the 6 hour Light Horse Ultra, I loved it so much as soon as I got home I registered for this one too. I was pretty confident that I was capable of finishing as I had ran most on road marathons and half maras besides the ones way up north and the ones further south than Busselton. The light horse ultra had to be done on my mountain tyres due the little sections of grassy and sandy patches witch over six hours added up, they are heavy pushing even on the smooth pavement. I managed to cover 48.5 kms over the six hours and thought well I can cover that distance on big wheels and sand surely if I put the marathon tyres on and I had 15 hours then theoretically I should be able to manage it as long as my health didn’t waste over Christmas and new year from being too festive and not keeping my fitness levels by not being active enough. I must be honest here, most of the time from before Christmas and building up to around the 12th I was stressing myself to pieces as I had talked with friends that I was going to do it, I even went out of my way to catch up with family who hadn’t seen in years’ as I had been embarrassed and ashamed of my past especially as I made a fool of myself in front off my whole extended family. When I called in for my visit I proudly told them about my new found love of running marathons while showing them my medals and telling them all of my next upcoming event, the biggest of my career to date the 100 km ultra on Australia Day and as well as me pushing from Perth to Melbourne as only a few of my relatives had heard of me claiming I was wanting and going to do it. ( I told them how I came up with the idea on the spot as I announced it when the presenter ran up with a megaphone asking how good It made me feel. In gloster park as soon as I finished run for a reason 21.1 km and how I went straight to Melbourne where I met a guy and mentioned I was determined to push from one side of Australia to the other I guess I expecting this guy to think I was a looney. But instead of being shot to pieces this man named Michael perner told me it was a great idea I told him that I really wanted to help raise a bit of funding so my aunt could have a car that wouldn’t conk out on her while her kids were in it when she needed it most. He told me how he had just help organise ride for youth and how they did a lot of fundraising for youth and kids with disabilities and how if I was serious enough to approach an organisation that would be interested in my fundraising goal, but before that to actually go and run a marathon and start racking a few up, cause let’s face it I had never even ran one before and here I was talking of running across the continent. He told me that I needed to find someone to at least be able to give me a bit of advice on what I need to prepare myself with and what it’s going to be like. He didn’t know any ultra runners but gave me the details of a man who rode his bike across America from east to west and also south to north while raising money for homeless people without any support. I never contacted him though I never actually really thought I’d get anywhere with it, I also thought if your going to do it without support that there wasn’t much to it. So I came back to Perth and the next thing I remember was seeing Gary Wilmot on the news and he was doing exactly what I had been telling people that, that was what I wanted to do and that he was running all the way to Brisbane. i had even already told a few friends about what an adventure it would be but im not sure if they shared the same views on how fun it would be, they encouraged me but, and i was with one of them when his inspiring story came on tv, i couldn’t believe it just when i thought that mabe i should get grip on reality and strive only for something that is actually achievable my friend turned to me and said when he gets back track that man down and mabe he might be able to tell you how to go about it and exactly what it takes. I couldn’t believe what i was hearing i thought everyone was laughing at me and it was the best words of encouragement iv eva had, time passed and it wasn’t until early April as hbf was approaching again and that I remembered about the fun I had at city to surf as well, where Id met some really nice people who also encouraged my big push and I was given Gary Wilmots details by other fellow runners but he was still out of contact as he still hadn’t finished his amazing adventure. I remembered where I’d put his details checked his website and found out he would be in the finishing area after the event where I was even able to find him and tell him about my crazy idea. He thought it was a great idea and even gave me a huge hug and even offered to be my mentor if I wanted I couldn’t believe it and all I had to do was go down to parkrun as he is a director there and we could discuss it further. He also inspired me to do the Perth marathon for my first and soon after he suggested the goldfields pipeline marathon and that if I managed that one without too much trouble that maybe I might have shot at my dream of pushing to Melbourne and that it may be possible. Just before I left for Kalgoorlie he made me an #HAA ambassador when I didn’t even think I was worthy, it was such a huge honour for me. As well as a announcing that it was going to happen. 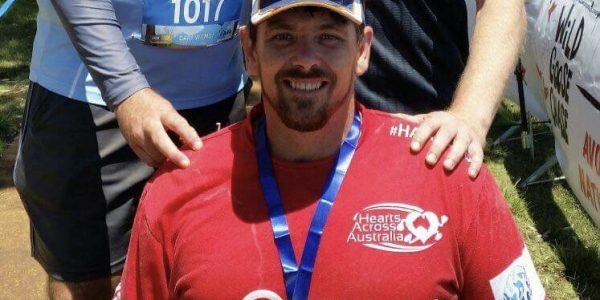 After reading all my recaps to my family and showing them my posts and commemoratives and explaining about Gary and hearts across Australia, I no longer felt embarrassed or ashamed of myself, I had to hold back tears as my uncle and aunt said said that they were really proud of what I had done to try and change my life one step at a time and how I come a long way over the last six years where I made a complete fool of myself in front of my whole family at a reunion as I had hit rock bottom. I told them that I had never been so ashamed, the person i upset most was my uncle that I really looked up too, it was his big night his 60th birthday and I will never forget the look of disappointment on his face he was really let down I could see it in his eyes and never wanted to hurt anyone like that eva again. This was the moment I realised I needed to change. I ran laps all over Melbourne and everywhere I went even attending three parkruns over Christmas and new year. On Christmas Day I was really worried as it was announced on the weather it would be 36degress and I was convinced that the weather would be close to 40 come event day. I was in an area that had miles of clay and it was really about forty so I had it in my head it would be even hotter. I also thought it was inland more (I haven’t done much traveling in wa) and that there would be no sea breeze and that the conditions would be like Rottnest island with bitumen road and no shade. It would latter turn out to be nothing what I had imagined I looked at the adu pictures from last year saw the coast and that we were shaded from the wind and sun then Harmony Jean Waite announced that the weather was only going to be 30 degrees. and how as long as you have put the training in that there’s really not much that will make a difference except for hydration,diet and a good frame of mind. And that we need to remember why we were there in the first place and that was to have a great time, first things first don’t stress because it doesn’t solve anything so just enjoy the moment so that was my plan witch really worked well for me here’s what happened! So the plan was that #HAA would be going down and taking part in the ultra 100 as a team and as it was a fifteen hour event. The race started at midnight so that most entrants would be finnished by the time it got to hot and people didn’t drop from sunstroke/ heat exhaustion. I had never been in an event where runners ran at nighttime before although trail runners do it all the time,but most of the night run paths are not suitable for wheelchairs. The #HAA team were really well organised with a great plan as well as a great setup for base camp. It was arranged for me to be picked up from home by Jocques on Friday afternoon around five pm we picked up Dale along the way about seven so we had arrived by nine, set the awning up Gary had already set up his awning and was looking relaxed when we got to here, nso it was just a matter of making sure everything was organised for when we had to start ie; water ready energy gels food for if we got hungry clean dry clothes to change into for when I got drenched in sweat and to make sure my lights were set up correctly as not to cause me problems along the way. I tried to get a bit of rest on the way up as well as after we set up before the start, but it just didn’t happen. So the safety requirements of running at nighttime is that you must be wearing night time hi vis vests and have a torch or a headlamp, I loved the fact that we were running at night because it made things really interesting. Everyone looked great lit up with their vests hi lighted so brightly and we were running along an old bitumen track where in some spots the trees had almost reclaimed it overhanging the road a lot of the way and while it was dark it had lots of creepy character. The road wasn’t rough the whole way there were long sections that were very smooth from resurfacing but it still had overhanging trees everywhere. The hi vis worked so well that I could see the other competitors for almost as far as the eye could see. The course was twelve and a half kms long with aid/water stations at 3km midway point, 6.25 km turnaround point and also at 9.25 kms midway back. So the course was a 12.5 km loop witch ment if we’re doing the full 100km it would be 8 laps so we have our debriefing meeting before getting ready to go and starting the run where we were told about these stuffed kookaburras hidden along the the way and that we had to scout them out but couldn’t pick them up until 4 oclock, 1 hour after the 50 km entrants had started as to give the a chance to find them as well. I’m sure I must have wasted at least forty mins over the course from slowing down looking for them and at 3.45 I found two, one and another one straight away, each kookaburra was worth an extra five points on your score so they were worth finding but as I picked up the second one I asked roger millet A fellow runner whom I ran with for a good stretch the the man that was nice enough to drive me to light horse ultra, if we could grab them yet thinking it was alright. I wasn’t wearing a watch and he replied fifteen minutes to go, so I threw them back in the scrub so I wasn’t being unfair on the others hoping to be inconspicuous but some other lucky runner either watched me hoik em back in or found them before I could make my way back again. That’s where I think I wasted most my time by trying to find more, I think they there put out there deliberately to distract people from focusing on running fast where if I had of just pushed a bit faster and not worried about finding them I know I could have managed a sub 12 that was my absolute dream time, I was wanting 13h hoping for 12.5h but secretly wanting 12 h It might seem like I say that like it must have been an easy run and before I did it my confidence was really high and I thought with the conditions being what I thought was petrfect for it. I had it in my head that it wasn’t going to be hard. But it was by no means easy. Next time I get told to respect the distance I’m going to.I really struggled on the last two laps and if I had to have completed 1 more lap I don’t think I would have made it. Not even with the amount of time left. I’d really like to congratulate Ron, Shaun as well as all the other people that made this happen, a fifteen hour event is no little feat it’s not something you just go out and get it over and done with then go home. After the 50 km runners were finished there weren’t a great deal of people still out there besides the volunteers Manning the aid stations and I’d just like to say that you guys are awesome as it was many hours latter before the last came in. Thank you’s for your time and an incredible event that il never forget for the rest of my life. The honorary trophy is amazing too and I was so overwhelmed when everyone applauded me the way they did. I didn’t think I was going to get as big as response as I did, thank you to every one that were there as Well you all make me feel like a champion when really I’m not. I’m just average,the same as most other people doing the same event. Maybe next time I don’t need a winners trophy it just doesn’t seem fair when you are the only one in your category. It was a really beautiful location to be at. My first time in Australind The best time I have had to date on any event ?